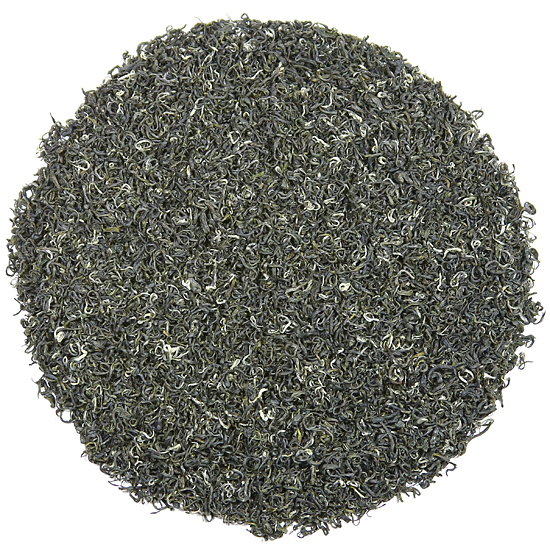 Huangshan Yun Wu green tea is from the 2nd tea harvesting season in China known as Yu Qian. It is plucked in April after the Pre-Qing Ming harvest. It is not a famous tea as is our Huangshan Mao Feng Tribute Grade green tea, but it is however, delicious and substantially less expensive in price. The cost factor is because there is a 4 week window of pluck time for making this tea versus only 2 weeks ( + – ) of pluck time for crafting Pre-Qing Ming tea. As a consequence of time, there is more Yun Wu made than Tribute Grade and the price reflects this. For Tea Trekkers who enjoy drinking our other country greens such as Dragon Whiskers, RiverStone, Yangtze Gorges Green and Rizhao, this tea will be a nice addition to your China green tea selection. Huangshan Yun Wu is made from larger, more mature leaf but there is no astringency in the cup. The flavor is more forthright than HSMF Tribute Grade so this tea is perfect for those who find the HSMF Tribute Grade to be a bit light in flavor intensity. Yun Wu is a transliteration for “clouds & mist”, a descriptor that refers to teas that are grown in high mountain locations where shifting weather patterns produce daily, nourishing, misty clouds that help to regulate the temperature over the tea gardens. Yun Wu teas can be from any of China’s green tea producing provinces in Eastern China, but tea gardens in Anhui Province in the vicinity of and on the Huangshan mountain range are particularly well-known for their “clouds & mist” tea. We are very fond of the sweet, delicious teas grown on and around the venerable Huangshan, so we are thrilled to have such a nice yun wu again this 2018 spring tea season for our customers to experience. For those interested in doing so, comparing the taste and flavor differences between the HSMF Tribute Grade and the Yun Wu tea would be an interesting learning opportunity; as is contrasting the Yun Wu with the other ‘country green’ teas such as Yangtze Gorges, En Shi Yu Lu, and Rizhao, etc. Huangshan Yun Wu is easy to steep and easy to drink. It has a buttery, silky texture, a pleasing flavor and a super-nice, vegetal aroma. It re-steeps well for 1 or 2 additional steepings, depending on the quantity of leaf to water than you are using. This is a glorious tea and one that tastes here just as it does when in the central portion of China. Any of our clientele who remember our beloved Ming Mei tea from years ago will recognize the flavor similarities to this HuangShanYun Wu. Note: as is true for the vast majority of Tea Trekker’s teas this year, our retail price for Huangshan Yun Wu is the same as in 2016 and 2017. This is remarkable, as the domestic Chinese market has exploded and much tea is being kept within the domestic market.